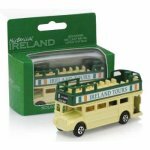 The Ireland Tours Open Top Diecast Bus . The Historical Green & Cream Souvenir Irish Double Decker Bus. Presented in a green matching Gift Box. The Open Top Bus will be securely packaged in a sealed box for posting.